I have been asked to compare every NHL team to a band, so here I am doing that. I have to say it was harder than I thought. Anaheim Ducks: Sublime. They are from California and pretty much exclusively for dirtbags. Arizona Coyotes: Oasis. In constant danger of not being a thing any more. Boston Bruins: The Dropkick Murphys. They’re fundamentally bad but you can’t tell anyone from Boston that. Buffalo Sabres: Thin Lizzy. You may know them from their Bad Reputation. Calgary Flames: Nickelback. Really bad, but their fans will swear up and down that they’re awesome and you’re wrong even though you are clearly not wrong. Carolina Hurricanes: Rage Against the Machine. Really good when they’re good. More often not very good. Chicago Blackhawks: AC/DC. Really only got super-big after a new guy took over, but then had a whole lot of hits in a short time. Colorado Avalanche: Coldplay. They’re awful and the guy in charge is insufferable. Columbus Blue Jackets: Dream Theater. Can’t imagine why literally anyone likes them. Dallas Stars: Muse. I feel like Jamie Benn is, like, super into Muse. He thinks they’re deep, I bet. Detroit Red Wings: Paul McCartney. Really good a long time ago, now just churning out mediocrity that everyone gushes over for reasons unknowable. Edmonton Oilers: Kings of Leon. People swear they were good once and you’ve seen some pretty compelling evidence to that point but looking at what they are now you’re still pretty skeptical. Florida Panthers: Ratt. Because of the throwing rats? I don’t know. This was a hard one. Los Angeles Kings: Red Hot Chili Peppers. From California and it’s kind of embarrassing if you like them. Minnesota Wild: The Replacements. Because the Stars left the Twin Cities and they came back, I guess? 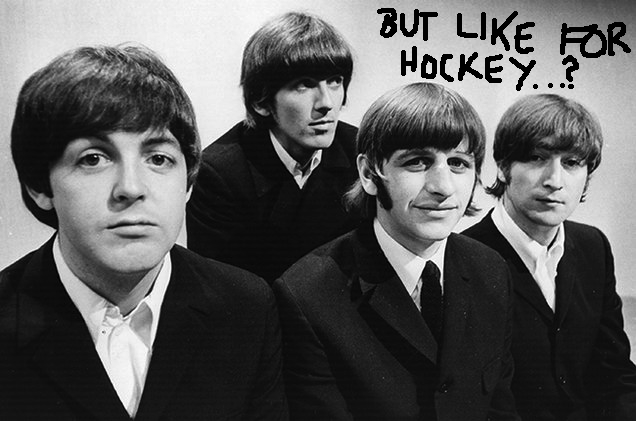 Montreal Canadiens: The Beatles. People still talk about things that were legitimately great in the ’60s and ’70s like they’re still important today. And if a young person is like, “Yeah but I’m not 100 years old so what do I care?” people yell at them. Nashville Predators: Diarrhea Planet. because they are from Nashville and they rule. New Jersey Devils: Bruce Springsteen. Obviously. New York Islanders: Billy Joel. Also obviously. New York Rangers: Ace of Base. Their No. 1 hit was in 1994, and you’ve heard it just about enough for one lifetime. Ottawa Senators: The Police. One super-talented guy ruined by a whole lot of garbage. Philadelphia Flyers: Guns ‘n’ Roses. I never got why people liked them or thought they were good. Pittsburgh Penguins: Queen. The ultimate singles band, and when the main guy goes you might as well fold up the tents. San Jose Sharks: Creedence Clearwater Revival. Not a single No. 1 hit but man, there’s a lot to like in the catalog. St. Louis Blues: Black Sabbath. Really heavy, really overrated. Tampa Bay Lightning: Blue Öyster Cult. One big hit, not a lot going on since. Toronto Maple Leafs: Bon Jovi. They retired the guy’s number and also the band is very bad. Vancouver Canucks: Pink Floyd. You’re better off not getting involved. Washington Capitals: Eagles. You won’t believe how spectacularly things fall apart. Winnipeg Jets: The Beach Boys. They really shouldn’t have come back. This entry was posted in Fundraisers on April 11, 2016 by lambert.